Nemo Memo – TeamViewer Will Improve Your Computing Experience – Forever! TeamViewer is a remote screen sharing, viewing, and controlling application, with a file transfer function. Using the Internet, your computer can see or be seen, and control or be controlled, by anyone, anywhere, in seconds, for free. You could use free screen sharing in OS X Leopard 10.5’s iChat to view and/or control a remote computer’s screen, and to exchange files, but the software has potential network glitches, from my experience. Seasoned Macintoshers can also accomplish the same thing via a Screen Sharing command in the Leopard Finder, with help of some geeky System Preference settings. YuuGuu, a startup in England, has the same capacity, plus a few enhancements. Its beta application is operative, but not yet in full release. Glance Networks, a friend and advertiser here at MyMac Magazine, is an affordable enterprise quality robust screen sharing company with a mature product cycle that is stable and dependable. It will be covered in depth in a future Nemo Memo. TeamViewer, from Germany, has a multi-tier pricing and user structure that favors individual, non-commercial personal computer users, both Mac and Windows. Software is free to download and use for most people. Learning to work with it takes ten to thirty minutes, depending upon your comfort and experience level, and how quickly you grasp the interface and options. Go to the TeamViewer home page and click START FULL VERSION on the left side. Within seconds, a 5.1 MB download appears on your Leopard or Tiger machine. Yes — TeamViewer works perfectly in Mac OS 10.4, and in 10.5. 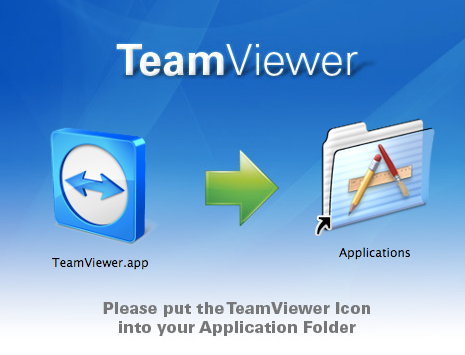 Open, verify, and mount the TeamViewer temporary installer virtual volume, and drag TeamViewer.app a couple of inches across the green arrow into the frontal alias of your Applications folder. Launch TeamViewer.app from your Applications folder and observe your new permanent nine-number ID and single-use four-number password, that changes each session. Have your friend, colleague, or family member go through the same procedure. Either one of you can initiate a session by typing the other’s ID into the white ID bar, making sure “Remote support” is selected, and then clicking “Connect to partner.” It’s easier to do than explain, as you quickly will see for yourself. Within a minute, you can view and control your pal’s screen. That’s it. No step three. A buried TeamViewer preference enables your cursor movements to be viewed on the shared screen: TeamViewer >> Preferences >> Advanced >> Show your partner’s cursor. Once you grasp the ease and speed of TeamViewer screen viewing and controlling, your collaborative and support experiences will forever sail with a strong wind to your back. In commercial settings, a reasonably-priced license with a full guarantee offers extra features that are not essential for most individual non-commercial users. I’ve been using TeamViewer every day for over two months. Inexperienced Mac and Windows folks don’t immediately grasp how to get the download up and running. The company needs to provide precise, detailed tutorials for all such newbies. The Help menu has links to a lot of valuable resource material and screen shots that are worth studying. Non-commercial support tickets are answered days later, by a real person in Germany with a good command of written English. Response time could be quicker, but free is free. The Customer module, also on the company’s home page, is for people receiving tech support who won’t need to control another computer. It works fine, as do the full application’s Presentation and File Transfer services. The free Mac version is newer than its Windows sibling, which has a few built-in additions that are not crucial for this introductory article. You’ll be reading and hearing more about and from TeamViewer in 2009 at MyMac.com and on our podcast. Q & A with Tilo Rossmanith, Founder and Director of TeamViewer. MYMAC: Please explain the history and development behind TeamViewer. TILO: The history behind TeamViewer is quite simple. We wanted to make it easier to help other people when they have computer problems without the time that gets lost when having to drive there. MYMAC: What are the key features and functions of TeamViewer? TILO: Key functionalities of TeamViewer are the remote support as well as the online presentation or collaboration, training or sales. Basically, it encompasses everything that has to do with desktop sharing. MYMAC: How does TeamViewer distinguish itself from other remote access applications out there? TILO: TeamViewer is simple, fast and secure and we’re pleased to provide a solution that is user friendly, reliable and very easy to understand. It is the one-stop solution that includes all modules (remote support, presentation, file transfer and VPN) in one simple and very affordable package. There is no annual fee and support is included. To summarize, TeamViewer offers a lot of value for low prices. There is even a free version for non-commercial use available. MYMAC: How would a first-time user access TeamViewer? TILO: We would recommend downloading the program from our Web site and try it out for free. If the user has any questions or requires help or further information, we encourage them to give us a call or send an e-mail. We are there to help the user with any question regarding TeamViewer and its functionalities. MYMAC: Explain how firewalls are (or aren’t) a concern for TeamViewer users. TILO: TeamViewer connects generally through port 80 and works with a complete encryption based on RSA public/private key exchange and AES (256 Bit) session encoding. This technology is used in a comparable form for https/SSL and can be considered completely safe by today’s standards. As the private key never leaves the client computer, it is ensured by this procedure that interconnected computers — including the TeamViewer routing servers — cannot decipher the data stream. Each TeamViewer client has already implemented the public key of the master cluster and can thus encrypt messages for the master server and check the signature of the master, respectively. The PKI (Public Key Infrastructure) effectively prevents “Man-in-the-middle-attacks.” Despite the encryption the password is never sent directly, but only through a challenge-response procedure and is only saved on the local computer. MYMAC: TeamViewer is a business solution that offers a free version for non-commercial use. Could you explain this in detail? TILO: The free version can be used in the private environment. That means if anyone helps friends or relatives in the free-time it’s okay to use the free version. Commercial use is every usage in a business environment and requires a commercial license. MYMAC: Could you explain the difference between the full version of TeamViewer and TeamViewer Quick Support? TILO: The full version of TeamViewer is the software that is required to create outgoing sessions as well as accept incoming connections. Only with the full version you have both possibilities. The TeamViewer QuickSupport is the customer module. This file does not have to be installed. It can be individualized with their own logo and text and be uploaded to their webpage, so that customers are able to download it there. The QuickSupport can only accept incoming connections and is not able to create outgoing connections. MYMAC: TeamViewer has just introduced a Host Module, which enables users to access unattended computers. Could you describe this utility further? TILO: The TeamViewer Host is running as a system service and is used for 24/7 access to remote computers, including login/logout and remote reboot — optimized for server maintenance or home-office access. With every TeamViewer license an unlimited number of free hosts are included. MYMAC: How many people can view a single session at once? TILO: There is no limitation of users that can attend one session. It just depends on the bandwidth of the internet connection and the upload of the users. Put TeamViewer to the test. It will change your computing, support, and collaborative workflows so that you’ll wonder how you ever got along without it.